The Dispute Resolution Interest Group and the Africa Interest Group of the American Society of International Law co-sponsored a daylong conference on March 11 on “The Future of International Arbitration in Africa.” The conference was also co-sponsored by Penn State and Greenberg Traurig, and it was hosted by the Washington office of Greenberg Traurig. 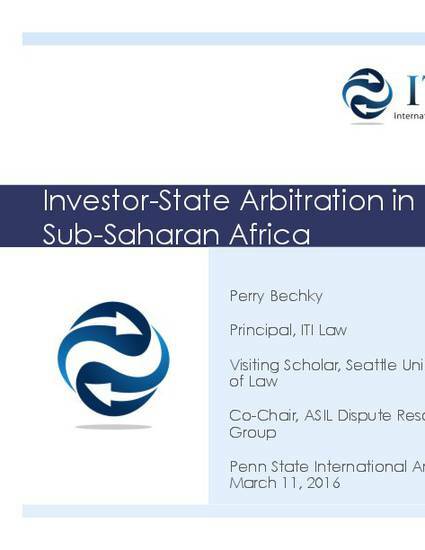 Video of the conference is available at https://pennstatelaw.psu.edu/news/experts-around-world-discuss-international-arbitration-africa-penn-state-law-event. (starting at 0:00:01). Attached here are the Powerpoint slides for these remarks.